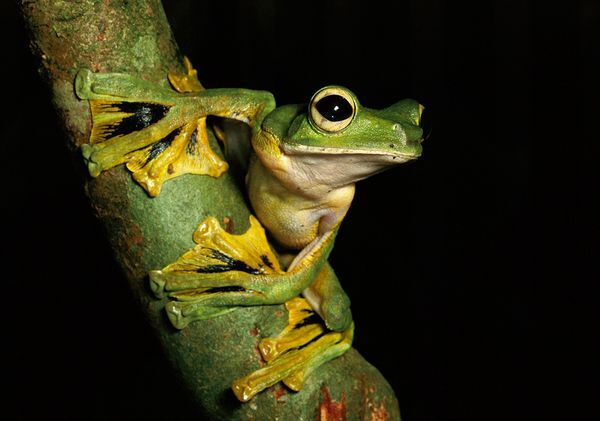 Wallace’s frog, The Abah River Flying Frog, The Parachute frog: a frog so unique yet with so many names. Regardless, this daring amphibian lives by swimming, jumping, hopping, and hunting insects the way all others frogs do and still took flight to add to its arsenal of skills! These creatures can be seen to have a knack for air travel right from birth as their eggs are attached to a plant that hangs directly over water, allowing their birth to create a free fall directly into the cool pool underneath them. This frog has learned a rare form of air travel that has yet to be seen in a bigger creature in its species and upon closer inspection, we can see the intriguing way in which it flies. From take off to landing, this is an animal that has found a way to adapt and evolve in a way that benefits it greatly and gives it an edge in the animal kingdom. Wallace’s Frog (its most common name) is a moss frog that can be found in the tropical jungle surrounding the Indian Ocean, specifically and most commonly Malaysia. 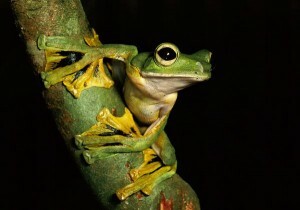 These frogs live strictly in the trees of these jungles, even catching all their prey among the leaves or in mid flight. The only time these frogs have been observed leaving their homes is when they choose to mate and lay eggs during the rainy season. While only growing to be two and a half to four inches big (the females growing to be larger,) it is still amazing how this is the largest frog with this ability of flight at its disposal to date. The key to the Wallace’s Frog’s success in flight is its clever manipulation of its webbed-feet. It jumps from an ideal location on a tree when escaping a predator or chasing prey and extends its toes as far away as possible to maximize the surface area and get as much lift as it possibly can. This allows for it to travel for recorded distances as far as fifty meters at a degree less than forty-five degrees to the ground, which is what allows it to not be classified as strictly “parachuting.” The almost beautifully simplistic way it flies coupled with its size allows for the frog to be one of the most elusive preys of these jungles. This type of gliding has been mirrored in many human projects such as people who glide by spreading their legs and arms apart with a “membrane” connecting them that allows for them to control their fall. While we may not have the reflexes or lightning quick observational abilities of Wallace’s frog, its still amazing conceptually. 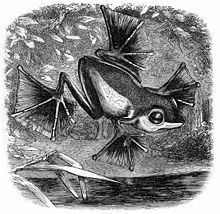 If we wish to apply mechanisms of nature into human flight, the flying frog is one of the most practical examples we could have. This is an animal that proves that old saying. Sometimes, simple is best!